One of the oldest wooden motor yachts in commercial use, Grace, is about to be launched again after undergoing a lengthy $300,000 renovation. The 18.29 metre boat is being restored at classic yacht refit specialists Moores Marine in Beaufort, North Carolina. It's a full restoration that has been underway since 2004, but began again in earnest in December 2014 and is slated to be completed by April this year. She is owned by the Palmetto Bluff community and managed by The Inn at Palmetto Bluff, a Montage Resort. 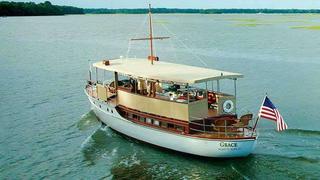 Grace is one of only around five boats that have celebrated their centenary still in commercial use in the US. Available for guests of The Inn, members of the community and general public for private charters, she can carry 24 guests and has a cruising speed of around 10 knots with her modern engine, a 350hp Caterpillar 3116. Her original engine was a 50hp 4-cylinder gasoline unit. Grace was commissioned in 1913 by Joseph B Cousins, a member of the Manhasset Bay Yacht Club, for his family’s use on Long Island Sound and the Hudson River in New York. She was built by the New York Yacht, Launch & Engine Company. Since then the boat, has had a long list of colourful owners. Among them was James Adams, owner of the James Adams Floating Theatre, which was towed to many southern coastal towns bringing entertainment and culture to isolated areas. Then named Sispud II, the boat would follow the theatre to all its destinations, often carrying distinguished guests. Novelist Edna Ferber wrote Showboat, which later became a smash Broadway production, from her experiences aboard with Adams. The vessel sunk in Thunderbolt, Georgia, in 1941, but was brought back to life and well maintained until the late 1970s, when she became abandoned on the hard at a backwoods boatyard. However, in 1990, a partnership of antique yacht aficionados moved her to Fairhaven, Massachusetts, where a rebuilding project was begun. In 2004, Palmetto Bluff acquired Grace, naming her after the sister of RT Wilson Jr., who purchased the 18,000 acres of waterside land there in 1902. Grace lived for a time at Palmetto Bluff after her brother purchased the land. She went on to marry Cornelius Vanderbilt III and became the most prominent society hostess in New York and Newport, hosting hundreds of parties for charity each year. In December 2014 the extensive current restoration began, which should be completed in the spring of this year.